Welcome to CF Labs. We build online tools and services to make consumers' dealings with companies fairer and simpler, or to improve access to important information and data. On this website you can find out about our projects, and tell us how we can improve them. 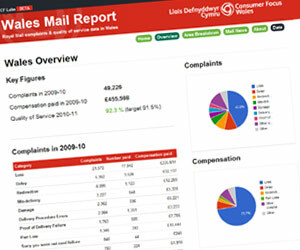 Consumer Focus Wales & CF Labs have published data on Royal Mail delivery performance, complaints and compensation payments. The Royal Mail has paid more than £400,000 in compensation to people in Wales following nearly 50,000 complaints. 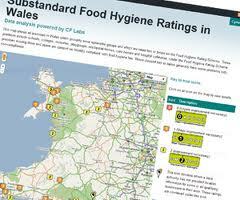 CF Labs has mapped premises in Wales that serve food to vulnerable people and have a substandard food hygiene rating. More than 60 schools, hospitals and nursing homes have been given a rating of 2 or lower. The map accompanies a report produced by Consumer Focus Wales. Community Post Offices is a new online directory charting the wide range of post offices operated by and for the community. Search for community post offices in your area, find out where are located, see what services they provide and register your own. Consumer Focus & CF Labs publish quarterly statistics on how the "Big Six" energy companies handle complaints. Take a look at the latest league table or view and download historical data. StayPrivate.org is our new service that makes it easier to reduce cold calls and unwanted mail. We've brought the Telephone, Mail & Baby Mail Preference Services into one place so that you don't have to fill out your details time and time again. You can subscribe to rss feeds, sign up to receive weekly or monthly email alerts and get a widget to display on your own site. CF Labs releases data every month showing the market share of each web browser across our range of websites. Take a look at the Google Spreadsheet showing the last 18 months worth of data. 27 July 2011 by Joe Cicero. No Comments. We sometimes get requests from companies asking us to remove their products from the Recalled Products website. These requests follow products being reclassified as fit for sale on the RAPEX website, the original EU-wide recalls resource from which our data is sourced. At first it seems to make sense to remove these products. After all, businesses could suffer adverse effects from a safe product continiung to be included on a website intended to show products identified as unsafe. 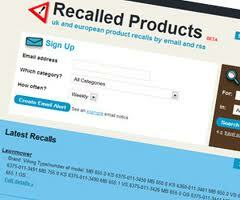 However, Recalled Products is just as much a register of safe products as unsafe. We believe that keeping information about safe products in circulation is as important as for unsafe products. Why? Up-to-date representation reduces confusion over a product’s current status. Consumers cannot be sure of a product’s status if it is eliminated from the Recalled Products site (and by logical extension from all and any sites carrying recall information). Thus we prefer to update the product entry with an appropriate message in order to provide a clear and current service. One of the first items you’ll see on such pages is a box-out clearly stating that a product is removed along with RAPEX’s stated reason for removal. We believe that responsible businesses should welcome this approach as it shows that the product is no longer considered a risk and can be used safely. A quick internet search reveals websites that continue to list products as recalled long after their reclassification as safe. We believe that it is actually beneficial to companies that the Recalled Products website gives the correct status of the product. To be fair, in all the dealings we’ve had with such companies to date, this policy has been accepted once pointed out. 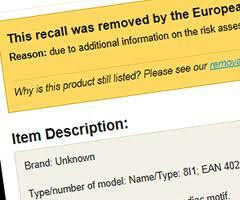 Our definitive policy can be seen on the recalled products website. 19 July 2011 by Dafydd Vaughan. 1 Comment. 2 May 2011 by Dafydd Vaughan. 2 Comments. 22 March 2011 by Dafydd Vaughan. No Comments. 3 February 2011 by Dafydd Vaughan. 1 Comment. We are the innovation arm of Consumer Focus. We build online tools and services to make people's dealings with companies fairer and simpler, or to improve access to important information and data.